The show opens tonight for preview, from 5-8pm with a $3.00 donation. The rest of the week, admission is FREE. Parking is always free. Now that the old exhibition hall has been demolished, the show is in the Cloverleaf Building, at the back of the fair complex. Tuesday – Friday hours are 10am-8pm. Saturday. 10am – 5pm. Decorative shutters and shadow boxes too. My items will be very easy to find. Most of my product is displayed on the tables directly to the left after you enter the building. I didn’t make the weathered wood potting benches, but they are pretty fabulous! Great for indoor decor use or outdoor garden work! Those dried hydrangea are from my garden. I brought quite a bit of Paris chic decor too. The rest of the displays were still ‘in progress’ when I left, so I didn’t get pictures of the rest of it. Lots of great spring home decor and Mother’s Day gifts, vintage, hand-made and upcycled goods. Jars of nests and eggs, jars of moss and bird cages. This shabby white cubby is $68.oo, and includes the hardware for hanging it on the wall. Making the most of every inch of display space; an old crate on top of the shelf gives me a little more room. Shabby wood bird-cage and dessert stand with cloche top underneath the table that the shelf is sitting on. More jars, big and small, of nests and eggs to the right. Another little grouping on the back side of the table. Very cool glass cake stand with extra deep lid. Vintage, upcycled ‘breakfast in bed’ tray. Tall glass cloches are perfect for showcasing childhood tap shoes and ballet slippers. Moved a few things around in Sophie’s Annex. Stop by for some spring decor inspiration for decorating and organizing. LOTS of unique baskets, trays, containers and crates for making organization fun and pretty! I HATE my living room lamps! They have those deeply pleated shades. You know, the kind that have LOTS of deep crevices for collecting DUST. UG!! Have been wanting to replace them for EONS. But I just haven’t found anything that I really LIKE. Then I found a shade that I really liked at Ross. 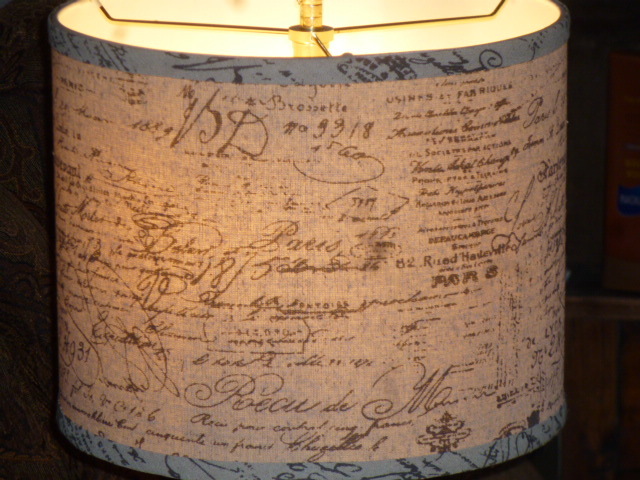 Have been seeing these ‘vintage document print’ fabrics on shades for a while, but they were always out of my budget. Gotta love the prices and Ross AND senior discount Tuesdays! 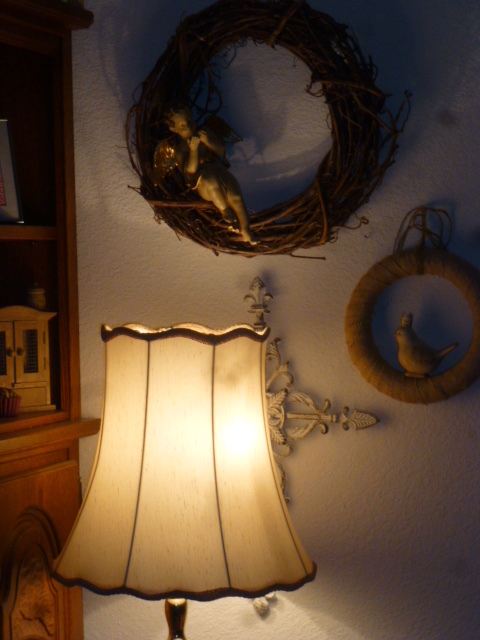 It’s even pretty when the lamp is ON! Dare I HOPE to ever find a similar or matching one for the other big lamp in the living room?!? Not more than a WEEK after I found the other shade at Ross, I found this one at Goodwill! I was originally looking at it as one to turn into a ‘skeleton’ shade, with all the fabric removed. 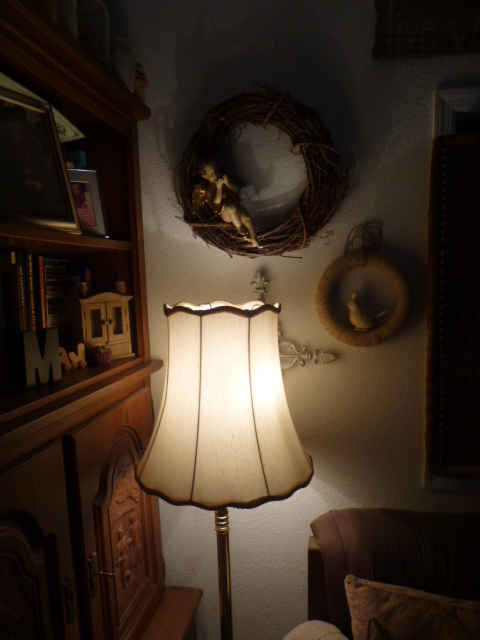 But it was SO perfectly CLEAN and in such good shape, I decided to see how it looked on the floor lamp. Not bad, eh?!? I’ve actually toyed with the idea of trying to stencil some old style lettering onto this one. But then if I RUIN it, I’ll be worse off than I was before, with NO shade for it! 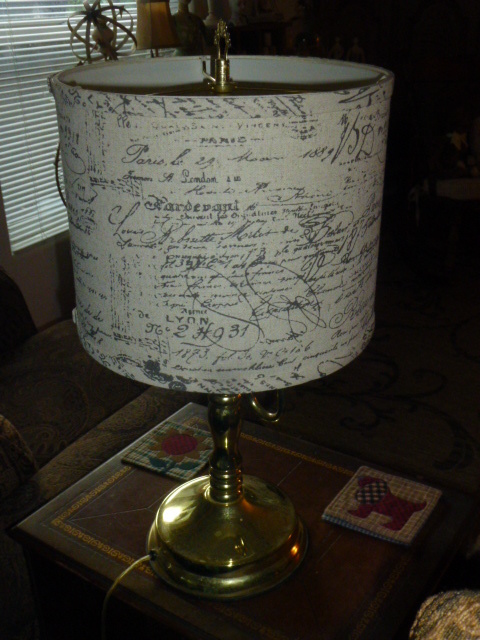 But if I ever do find a better shade for this lamp I will for sure try to stencil this old one. And if I ruin the fabric I’ll just do what I was originally going to do with it and ‘skeletonize’ it! 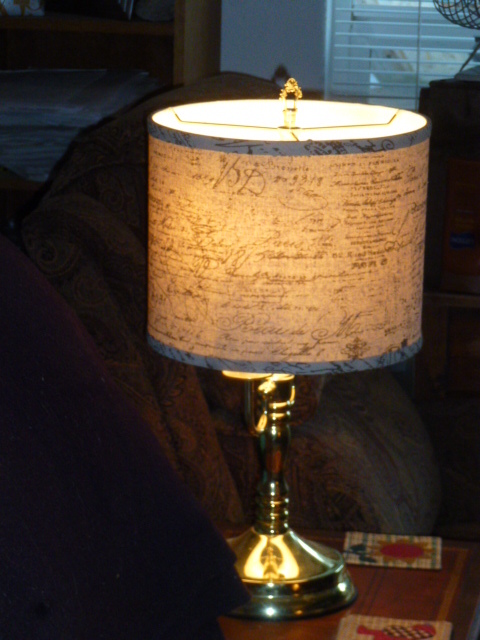 This is what the other living room lamps look like. Both of these are ‘thrifted’ lamps and shades too. The bases are the same, but the shades are slightly different. I really like the new trend of not having everything ‘matchey’matchey’! Bold paint colors on walls: To paint or not to paint. This post started out as a reply to a comment in my blog, but I decided it really needed to be a post. Someone asked about ‘my beachy blue’ paint color because they wanted to paint some wall that color. Here’s the answer to ‘what color do you use? ‘ Just in case anyone is wondering. As much as I LOVE color, (obviously!) I would NEVER paint the walls in my home a bright color. I’m not even a fan of accent walls. My preference for wall paint is, and ALWAYS has been, soft neutrals. And I KNOW the ‘real design world’ would argue profusely with me on this, but I have GOOD reasons. 1) The color you are ‘in love with’ today WILL change. Do you really want to have to repaint an entire room when you tire of that color? 2) The design trend WILL change too! Used to ALWAYS be on the ‘sell this house’ make-over show that they DEMANDED all neutral walls in the homes they helped update for sale. Then all of a sudden it’s RED accent walls in every home! What’s next?!?! Who knows! The point is, it’s GOING TO CHANGE! 3) Do you REALLY want to re-paint over those bright walls in a few years? If you just can’t stand to NOT have some bright or bold color on your walls, at least start with just an accent wall. ‘Live with it for at lease a MONTH before you commit to an entire room. Better still, live with it for a YEAR before committing to doing a whole room. 4) There are a bazillion OTHER WAYS to bring glorious color into a room. Less permanent and overbearing ways. Less expensive ways. Less time consuming ways! AND more flexible ways! With your ACCENT PIECES and accessories. Personally, I even prefer very neutral sofas and bedspreads. That way, IF I want to, I can change the entire color scheme and feel of a room on a shoestring! If you are STILL really REALLY dying to paint a whole wall or room, try this first. Go to the dollar store and buy 10 or so pieces of poster board for 50 cents each and paint them your color. Hang them on the wall and see how you like it. I know, it’s a little extra time and money to invest, but TRUST me; It’s a LOT easier to pull those off the wall then to re-paint over a red wall! HOW do you bring color into a room if not on the walls or you primary piece of furniture? Everything and/or anything else! Throw pillows and comforters on a sofa. Pretty curtains (even if there AREN’T any windows; you can still hang curtains!) Hang colorful tapestries on walls. PICTURES! Gallery walls of colorful frames, JUST the frames with no backing or anything inside! Small accessories on shelves can (and should be!) color themed. Balanced with neutrals. Pretty up your book shelves by covering your books with colorful paper. OR turn the books BACKWARDS for a more neutral look. Paint your other furniture! Coffee and end tables, benches, stools. Lamps? Sure you can paint lamps bright pretty colors too! I WISH I had examples to show you, but I think you get the idea. Just BE SURE you really can LIVE WITH a color before you commit to painting a whole room! P.S. ONE Exception! I DO like color on BATHROOM walls. But they are pretty small rooms! Long time, no blogging . . . catch up post; a little bit of everything! Hallelujah! It is FINALLY cooling down. And even just started to RAIN (just as Michael and I were preparing to start on some ‘outside’ projects). But I shan’t complain. I’ll leave him in the workshop by himself, and I’ll catch up on internet stuff. I’ll take THIS weather over THAT weather ANY DAY!!! It was a VERY busy day at the store yesterday with the estate sale. BUT, I had a LOT of stuff and there is still a ‘good amount’ (probably sold 1/4 of what we had) left. All the leftovers have been moved into the shop and will be available at 20% off. Here are a few pictures of the sale all set up. I barely had time to snap them as it got busy right off the bat. Michael brought the truck and trailer and helped my unload and set up. He had gone to the bathroom before leaving and in the two minutes he was in there, the store FILLED with customers! He came out, and before he rounded the corner where he could see into the store, I whispered to him “Get out while you can!” WHAT??? I repeated and pointed into the store. He gave me a quick kiss and hightailed it outta there! So, now my living room is pretty BARE! As you can see from these two pictures of the entertainment center and shelf above it! I’m going with lots of ‘neutrals’ this time. A simpler country look. But before I get going too much on the ‘decor’, we’ve got to get some FURNISHINGS in there! The two trunks we sold at the estate sale had been our coffee table and an end table. The wicker love seat and two chairs, our only additional seating, and the wicker table was our other end table! He gathered up some old white fence boards already. He used 2×4’s for the legs on the one shown, but thinks 4×4’s will be sturdier for our coffee table. Once he gets all the pieces cut to size, I’ll ‘drybrush’ on some light ‘sand’ color paint (I don’t want it so starkly white) and them he’ll assemble it. I’ll add a pillow or two for propping feet upon (we HAVE to put our feet up on the coffee table!!!) and we’ll be done! Not much time to hot garage or estate sales the last couple of weeks, with doing the Farmers Market and readying the estate sale. I did make it into Goodwill and found a few treasures. I’m ‘on a mission’ to go to GW EVERY week and track the ‘color of the week sale tickets, so I’ll know which color is coming up next. (IF they actually have an ‘order’ they do it in!). I’ve been trying to only buy things that are half off, especially of they the original price is over $3.00. I have always LOVED this style of wicker chair! “I thought we were getting RID of all the wicker?!? !” Michael lamented. All the OLD wicker, I replied. This is totally different! The green is a tad faded on the backing. I’ll probably dry brush paint over the wicker parts with some antique white, and leave the legs ‘as is’; and add a nice cushion seat. How cool is this VERY old folding chair!?!?! Even the legs fold in (it’s sitting on top of a small tale in the pic) Perfect to take to Farmers Market to sit on. A white feather wreath!!!! Never in a million years did I think I’d actually find a white feather wreath that I could actually afford to buy! It was my lucky day for sure! A neat copperish colored wire basket. It’s in the store filled with glittered fall fruits. An old wire Christmas card holder that I plan to use to display TAGS on. I better go see how Michael is coming along on the coffee table and get my paintin’ arm ready to go!